As an engineer or designer, you’re likely faced with the challenge of sharing data with various departments in an organized manner. The dilemma comes when others have access to too much information at the wrong time. In this recap of an Autodesk Virtual Academy webcast, Nigel and I reveal how to develop workflows to get from a Work in Progress to a Release state with Vault Professional Lifecycles. You’ll also learn how to add and edit lifecycle states, set automatic revisions, and configure categories to set default lifecycles. Let’s take a look. If you missed the webcast, watch it below. Subscribe to our YouTube channel and never miss a session. At my very first engineering job, one of my tasks was to organize our files. The purpose was for a new Autodesk release – Vault (then known as trueEVault). I didn’t realize then I would be laying the groundwork for my experience for what I am sharing with you today. Over the years at KETIV, I’ve been involved in hundreds of Autodesk Vault for Data Management implementations. Anything from a simple workflow for a small startup – to multi-department companies with many workflows that cross oceans and borders – to even delivering services in Mexico City on many occasions. This is one of my favorite topics to present, so let’s take a look at how you can get started. What Steps Are Involved in Getting Started? Typically, groups are organized as: Sales and Marketing, Engineering, Engineering Managers, and Shop Floor. Once you’ve identified these groups, you’ll want to develop the who, what, where, and when – better known as the ‘workflow.’ You’ll also need to figure who will control various factors in the workflow. The next step is the setup. This is actually the easy part. But don’t take my word for it. Watch the Autodesk Virtual Academy session to take a deeper dive into the details. Not only do I walk you through the entire process above, I show you how to create a new lifecycle, apply it to a default category, and assign automatic revision bumping. What version of Vault do I need for Lifecycles? You need Vault Professional or Vault Workgroup. Vault Basic does not allow you to create lifecycles. Are there any issues with implementing on existing databases? There should be no issues. 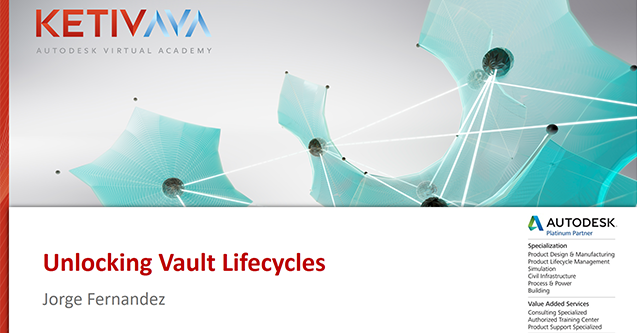 Even if you’re working in existing databases with Vault Basic, you can modify Vault Lifecycles with Vault Professional.